Awww. Look at hubby in the background. What you can't see is our husky puppy Raiden behind the cocktails. He likes to run tethered besides hubby, channeling his inner sled dog instincts. So cute. I was channeling my weekend instincts. You know, the instinct to make a cocktail every weekend. Don't blame me, it's genetic. I adapted this gene to survive in life. So, you might be wondering about the name: We Jammin'. Well, it's because there is a genius ingredient in these cocktails. Yep. You guessed it. Jam. Before you begin mumbling at the screen and questioning my judgement, hear me out. The jam is sweet and fruity, and when mixed with liquid, it adds an amazing flavor as well as texture. The pectin (thickener) in the jam gives the cocktails some body and you see tiny fruit pieces in the cocktail. OMG. You have to try it. If you have jam at home and some kind of liquor, there is no reason you shouldn't be making this. I mean, I can think of a few reasons why you shouldn't but spare the details. Spare the details. You only need one type of jam per cocktail. I made two cocktails, one with strawberry jam and the other with peach. Please don't make fun of the water spots on my shaker. I love my dishwasher and I'm not ashamed of it. If you don't have a shaker, do not despair. Just violently shake the cocktail with a spoon, take out the week's frustrations as you do so. See, this drink is a stress reliever in many ways. A *heaping spoonful* (it's like when they say the name of the movie during the movie) of jam. Whatever fruit jam you have is perfect. If you like it on toast, you'll like it in a cocktail. Then toss in a sprig of mint. Cut a lime into quarters. You only need two quarters per cocktail. Then add the juice of two of the quarters, an ounce (or more) of vodka and a 1/4 cup of water. Now shake until your hands are about to develop frostbite. Or for about 30 seconds. Then drop those lime wedges you just squeezed into a glass. I hope you didn't throw them out. Top with some ripped mint leaves and ice. Finally, pour the cocktail in. I repeated the process again except with strawberry jam. Pour some ice into a cocktail shaker. Add the vodka, jam, water, juice of the limes and sprig of mint into the shaker. 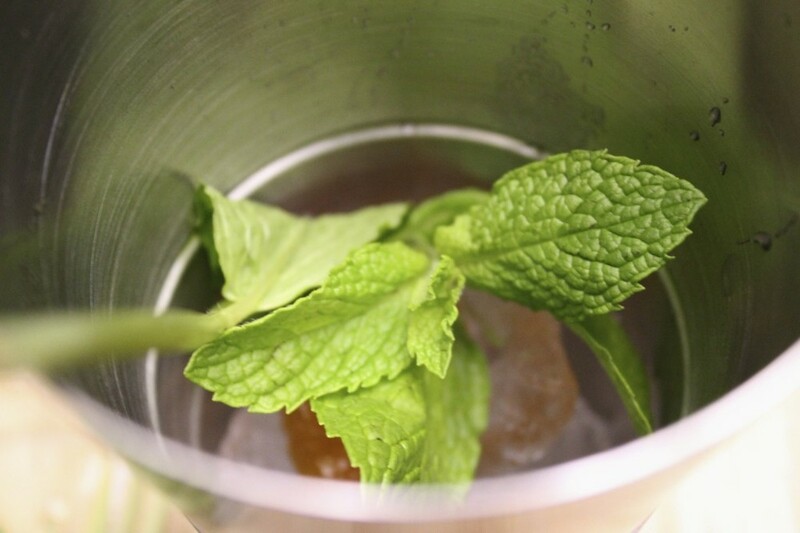 In the glass you will be using, drop in the squeezed lime quarters, a few ripped mint leaves and ice. Pour the cocktail into the glass and enjoy! Responsibly.